Real Betis faces Valencia in one of La Liga‘s most exciting 33rd rounds. The match will be played on April 21, Sunday at 7:45 pm at Estadio Benito Villamarin in Sevilla. The hosts at this match – the Real Betis team, are in ninth place in the standings with a total of 43 points. The Green-and-Whites are three points behind in the seventh place and their goal is to qualify for the Europa League. Real Betis, however, has to look for a mandatory three points in his household in Valencia, which is in sixth place with 49 points. The guests ranked at the 1/2-finals in Europa League in the middle of the week after eliminating Villarreal after a second win of 2:0 and a total score of 5:1 after the two matches. Real Betis has won 38% of their matches this season. Quique Setien’s alumni play better at home after Estadio Benito Villamarin won 44% of their matches. In the last three households, however, the team lost twice. Real Betis retreated 1:4 Barcelona and 1:3 in Getafe in some of their most recent households, but in their last home game Villarreal beat 2:1. In the last six home games of the team were hits in the two doors – one of these matches was with Valencia at the 2:2 draw in the Copa del Rey tournament. Els Taronges are in very good shape with five wins in their last six matches in all tournaments. Valencia is in the fight for two trophies after qualifying in the Spanish Cup final against Barcelona and continues the 1/2 finals in the Europa League where he will play with Arsenal. Marcelino’s graduates beat Levante 3-1 in the City Derby last weekend and scored their 11th victory since the start of the season. The Los Ches are just three points from the fourth Sevilla, so guests are also pursuing a Champions League. In the first match between the two teams this season in La Liga were not scored hits and the result was 0:0. Valencia won 6:3 in a memorable match on their last visit to Estadio Benito Villamarin in 2017, and in the upcoming match we will see goals in both doors. It’s always a very passionate affair when Sampdoria and Genoa meet each other in the big derby of Genova. This will happen again at the Stadio Luigi Ferraris on Sunday and we are going to take a look at this fixture in our vip soccer predictions today. At this moment Sampdoria are in a better position in the league compared to their next opponents. Samp are 9th in the Serie A standings with 45 points, still having some chances to finish 6th and win a place in Europa League for the next season. But the truth is that Sampdoria made a lot of mistakes this season, so this is a hard goal to reach. Marco Giampaolo’s team is entering this game after losing its last two matches against Torino and Roma. Samp clearly need some shaking up at the moment, so a win the derby is the best way to do it. You can be sure that this is exactly what the fans want as well. Let’s see what’s going with Genoa as well. Il Grifone are currently holding the 15th place in the Serie A with 34 points. Their record in the league goes like this: 8 wins, 10 draws and 13 defeats. Genoa’s last five games ended with just one win, one draw and three losses. In their last fixture Cesare Prandelli’s boys fought hard for a 1-1 draw against Napoli at the Stadio San Paolo, despite of Stefano Sturaro’s red card after just 28 minutes of playing. Darko Lazovic scored for Il Grifone after an assist from the veteran Goran Pandev. The Genova derby between Sampdoria and Genoa is always a fantastic game to watch. You can be sure that the passion will be here. We regard Sampdoria as a favourite in our vip soccer predictions today, but in a derby everything is possible. Valencia hosts Levante in the city’s derby of the 32nd round of La Liga. The match will be played on the Estadio de Mestalla on Sunday, April 14th as the hosts are favorites for the victory. The Valencia team made a big step towards the 1/2 finals in the UEFA Europa League. The Bats won their visit to Villarreal 3:1 on Thursday, making a very good advance before the rematch of Estadio de Mestalla in a week. It seemed like the match would end 1:1, but in the closing minutes of the meeting, Marcelino’s graduates scored two hits. The midfielder Daniel Wass scored 2:1 in the 90th minute and in the third minute Goncalo Guedes scored his second goal in the match and gave Valencia an excellent advantage before the second game. The Valencia team is now turning their attention to La Liga, where they are going to have a city derby with Levante. The Oranges are fighting for a place in the Top 4, after 31 games played sixth position with a total of 46 points and four points behind the fourth in the Getafe. The Marcelino alumni have three wins in their last five league games and on their own terrain they have no defeat in 18 consecutive matches in all the tournaments. In his last home game, Valencia beat Real Madrid 2-1, before making a draw 0:0 against Getafe. The Levante guests occupy the 15th place in the standings and are only three points above the danger zone. The Frogs have won 26% of their matches this season, with their 33-point assets not allowing them to be at ease for their place in the elite at this time. Levante won three points in his last five matches in La Liga after he scored three draws and two defeats. In the last round, Paco Lopez made a 2:2 draw against Huesca, before losing 2:3 to Athletic Club. In the last three games of Levante, four or more goals were scored, so soccertips88.com tipsters think the over 2.5 goals option will be a winner for Estadio de Mestalla. Fortuna Dusseldorf hosts Eintracht Frankfurt in a final match of the 25th round of the German Bundesliga. The meeting will be played on Monday, March 11, starting at 7:30 pm at the ESPRIT arena stadium in Dusseldorf. Fortuna Dusseldorf was very strong in 2019 and won a lot of positions after the second half season. Friedhelm Funkel’s graduates are on the 11th place in the 31-point table, being just three points from the tenth Hoffenheim. The hosts have won 38% of their matches, having six wins in 12 games in their own field. However, Fortuna Dusseldorf has lost its remaining six games on the ESPRIT arena, so it can not be said that it is very stable on its own terrain. However, if we look at the last home games of the team, Fortuna Dusseldorf has four wins and one loss in the past six games. The hosts scored 17 goals in 12 games in front of their own audience. Dodi Lukebakio is the top scorer of the eight-goal team while Benito Raman has made six hits. In the last round, Fortuna Dusseldorf defeated Schalke 04 in a categorical way with VELTINS-Arena 4:0. Dawid Kownacki made two goals for the success of his team, and one shot added Benito Raman and Dodi Lukebakio. In the last home game, Fortuna Dusseldorf defeated Nurnberg 2:1 with a hard one, before winning 3:0 against Stuttgart. The Eintracht Frankfurt team is fifth in the standings with a 40 point asset. The Eagles have won 11 of their 24 games since the start of the season in the Bundesliga. Adi Hutter’s team is only six points away from the Champions League area, with less than a match in the league. Eintracht Frankfurt has won 42% of its visitors this season with an average of 1.67 goals per game. In 58% of the team’s fights away from home and both teams scored a goal, so in my opinion the BTTS option is a pretty good bet for the upcoming ESPRIT arena. This weekend’s Premier League football program kicks off with two matches on Friday, one of them being the London derby between West Ham United and Fulham. The duel has a starting time of 7:45 pm on the London Stadium as the hosts are favorites for the victory. West Ham team is 10th in the standings with 33 points, which have two more teams – Everton and AFC Bournemouth. The Hammers are two points from the eighth Watford and are four points behind the seventh in the Wolverhampton. The hosts will strive to win the three points on Friday against Fulham and improve their position in the standings, with a greater chance of ranking in European club tournaments. West Ham United have won 35% of their matches this season. They have scored 32 goals and scored 39 goals in their goal. The top scorer of the hosts is Felipe Anderson with eight goals scored, while Marko Arnautovic has scored seven hits since the start of the season. In his last home, West Ham performed well and won 1:1 against one of Liverpool’s favorites. Previously, Manuel Pellegrini’s graduates beat Arsenal 1-0 and defeated Birmingham City 2-0 in the FA Cup. West Ham United have scored 18 points in their 13 home games so far, and if they improve their performance on the London Stadium, they will have more chances to play in the first half. Fulham’s team is ranked 19th in the standings with a total of 17 points. The Cottagers are eight points out of the rescue zone and their stay in the Premier League is under serious questioning. The team led by Claudio Ranieri is the weakest guest in the league with only two points won on a foreign field. In its 13 away games this season Fulham scored eight goals and scored 32 goals. West Ham United team should take advantage of the weak form of the opponent away from home and in my opinion the hosts will win the match at the start of the 27th round in the Premier League. Manchester City is visiting Newcastle United in a 24th round of the Premier League. The meeting will be played on Tuesday, January 29, at 10:00 pm at St. James’ Park. Newcastle United hosts have a hard time tonight to meet Manchester City champion, who has no right to make a mistake in the Liverpool title fight. Newcastle ranked 17th in the standings with 21 points. The Magpies have won 22% of their 23 matches this season in the English Championship. The hosts scored 19 goals and scored 31 goals in their goal. Salomon Rondon is the top scorer of the team with five goals scored, while Ciaran Clark and Ayoze Perez have scored three goals. Newcastle has trouble in attack but does nothing during the transfer window to boost his attack. Rafael Benitez is disappointed with the lack of funds for transfers and can leave the club very soon. The Spanish manager ranked the team in tenth place last season, but in this campaign, The Magpies look a lot weaker. In his last home game in the Premier League, Newcastle recorded a 3-0 victory over Cardiff City before defeating Manchester United 0-2. The Manchester City team has no problems with hitting points as the most successful team in the league with 62 goals scored. Raheem Sterling and Sergio Aguero are leading Premier League top scorers with 10 goals scored this season. Manchester City ranked second with 56 points and is still four points behind Liverpool. Pep Guardiola’s graduates are in an impressive series of eight consecutive wins in all the tournaments and are favorites for Tuesday night’s success. In his last Premier League match, Manchester City easily knocked Huddersfield Town 3-0 as a guest. Pep Guardiola‘s team won their last two visits to the league by scoring three hits, so I would bet Manchester City to score more than 2.5 goals in the match, and guests should win with at least two goals difference. Tottenham Hotspur faces Chelsea in the first 1/2-final match between the two teams of the EFL Cup. The match will be played on Tuesday evening at the Wembley Stadium with a very controversial fight. Tottenham Hotspur strives to win the first trophy since 2008, with the Spurs now just two steps away from winning the Carabao Cup. Mauricio Pochettino’s team has to deal with the Chelsea team if it wants to reach the final of the tournament. Tottenham Hotspur has already scored a success against Chelsea this season by winning 3:1 in the Premier League on its own pitch. On Friday, Tottenham Hotspur had a performance in the FA Cup tournament and recorded a comfortable 7:0 win against Tranmere Rovers. Pochettino gave a chance to a lot of reserves and young footballers at this meeting, with the star of Harry Kane appearing as a reserve in the second half. In the upcoming match, Mauricio Pochettino will not be able to rely on Jan Vertonghen, Victor Wanyama and Mousa Dembele. Eric Dier is also in question for the match, as Hugo Lloris, Kieran Trippier, Toby Alderweireld, Moussa Sissoko and Christian Eriksen should return to the tournament after being given a break on the Tranmere team. Tottenham Hotspur won both matches against Chelsea with a 3:1 score last year, and we are looking to see if the Spurs will be successful against this rival. Chelsea’s team beat the Nottingham Forest team 2-0 on Saturday in a FA Cup 3rd round match. Alvaro Morata scored both hits for Maurizio Sarri, but the Spanish striker missed a lot. Young midfielder Callum Hudson-Odoi made a very strong match and may have started as a Wembley champion after Willian was questioned for the match and Spaniard Pedro was injured. Chelsea will aim not to lose this match and have good chances to qualify for the final before the rematch of Stamford Bridge in two weeks. I think in the first game between Tottenham and Chelsea we will see more tactical playoff between the two teams and will not fall more than two Wembley goals. Manchester City faces Crystal Palace in an 18th round of the Premier League. The duel will be held this Saturday, December 22, at Etihad Stadium, with hosts being the big favorites for the victory. Last season’s Manchester City champions took second place in the standings after 17 rounds. The hosts have won 82% of their 17 matches this season, bringing the impressive 48 goals – most of the league’s. On their own terrain, the team is even stronger by winning all of their 9 households and has scored 33 goals – an average of 3.67 per game. At home, Pep Guardiola’s team made only six hits, making Crystal Palace chances of being quite small. In the middle of the week Manchester City qualified for the League Cup semifinals after eliminating Leicester City’s team after shooting. In their last championship, “citizens” beat Everton 3:1, and a few days before they beat home Hoffenheim with 2:1 in the Champions League. Manchester City is in a series of nine consecutive wins in its own field and seems unlikely to take a wrong step against Crystal Palace, which has lost 4 of its last 5 away games. Crystal Palace team is 15th in the Premier League standings with 15 points to their name. Roy Hodgson’s team performs poorly this season and the team’s problems are in the offensive – only 14 goals scored in 17 games, this being the second-lowest attack in the league. The Eagles have won just seven points in nine games with 9 hits and 15 goals. Crystal Palace has scored six goals in its previous two visits against West Ham United (2:3) and Brighton & Hove Albion (1:3), so expect Manchester City to congratulate the win and see more than 3.5 goals in the match . Atletico Madrid is coming to Real Valladolid in a 16th round of La Liga. The meeting will be played on December 15, Saturday, at the Estadio Municipal Jose Zorrilla in Valladolid. The hosts in this match – Real Valladolid team – rank 12th in the ranking with 20 points in their assets. They have won 33% of their first 15 matches in the Spanish Championship this season. The team is among the lowest scores in the league as it has scored 13 goals – an average of 0.87 goals per game, while at the same time it has scored 15 goals. Real Valladolid played well in defense, having received 0.88 goals per game, so this match will be a serious test for the Atletico Madrid team. In the last round, Real Valladolid beat Real Sociedad as a 2:1 guest and recorded a second straight success in all the tournaments. A few days before, Valladolid defeated Mallorca 2-1 for the second time and qualified for the 1/8-finals of the King’s Cup. Real Valladolid won two of his last five home games in all of the tournaments, and will now try to oppose the much-class Atletico Madrid team. Diego Simeone’s team satisfied himself with a zero draw on the Club Brugge pitch in the middle of the week, making him second in his Champions League group and having a tough rival on the 1/8-finals. Atletico Madrid, however, extended its series without losing 11 matches in all the tournaments. In the last round in La Liga, Diego Simeone’s graduates beat Deportivo Alaves 3-0 on their own ground and before that they made a 1:1 draw on the pitch at Girona. Atletico Madrid has a chance to equalize points with the leader in Barcelona if it won this match of Estadio Municipal Jose Zorrilla. Los Rojiblancos is currently ranked third with 28 points, and I think he has great chances to triumph in Valladolid. I think French national Antoine Griezmann will be the key player for this meeting and I believe he will lead his team to victory. Juventus faces Valencia in a fifth round of Group H in the UEFA Champions League. The duel will be held this Tuesday, November 27, at the Allianz Stadium in Torino as the hosts are favorites to win the three points. Juventus ranks first in Group H after four rounds. The Italian champions recorded three consecutive wins in the race, then beat Allianz Stadium 2-1 on Manchester United. This defeat in Torino was quite surprising for Juventus. “The old lady” controlled the game completely and had an advance in the result, but collapsed in the closing moments and allowed two goals from static positions, with which the English club recorded a second success in the tournament and approached two points to Juventus. Massimiliano Allegri’s alumni will now try to return to victory, and they have already played Valencia with 2-0 in the tournament. Over the weekend Juventus recorded a 2:0 victory against SPAL in the Italian championship, where it was convincingly led by 13 rounds. Massimiliano Allegri’s team has eight points ahead of second-placed Napoli, being in a series of four consecutive wins in the championship. Juventus recorded 11 victories in its last 13 home games, and most football specialists are expecting the “bianconers” to win the upcoming match. The Valencia team has five points in its assets in this not lightweight group. The guests have one win, two draws and one loss in the race, as their only defeat was Juventus. In the last round Valencia beat Young Boys 3-1 on their own field but now has a much more difficult match. Valencia is in good shape by winning its last three matches in all tournaments, scoring seven goals and only one shot. Over the weekend they beat Rayo Vallecano 3-0 on their own pitch. Far from home, Valencia has been defeated in eight consecutive matches in all tournaments, not even losing to Old Trafford on a visit to Manchester United (0:0). In the upcoming match, however, I expect Juventus to show his class and especially Cristiano Ronaldo, and I think the hosts will win the game. Greece hosts Finland at a meeting of the UEFA Nations League. The match will be held on Thursday, November 15, at the Olympiako Stadio Spyros Louis in Athina. The two teams are in league 2 of League C in the tournament and are in first place. Finnish guests have a much better chance of winning the group after four wins in four games and 12 points seem almost unattainable on top. Greece is the team that can move them from the first place in the final standings, but this can only happen if the hosts win their last two games, and the team of Finland admits two defeats. Greece started its tournament with a minimum of 1:0 against Estonia. After that, the hosts were defeated by Hungary with 2:1, and also lost their trip to Finland with 0:2. Greece made it home with the Hungarian team for its second success in the group, but given their two losses, their chances for the first position are not great. Finland is a clear leader with 12 points and four wins in four games, with the Scandinavian goal difference being 5-0. There is still no team to score a goal for Finland. The guests won 1:0 against Hungary and Estonia at home. Then they beat the Estonians on their visit to Tallinn with 1:0, and in their last match in October they beat Greece with 2:0. Are Markku Kanerva alumni able to win the three points in Athina? Greece has only two victories in its last eight home games. They are not convincing on their own terrain and will have serious problems against Finland. Taking into account the shape of the guest team’s Markku Kanerva, I would bet X2 at this meeting. Also the results of the two teams so far in the group suggest that we will not see more than two hits in the game. Real Sociedad faces Sevilla in a match of the 11th round of the Spanish La Liga football championship. The duel will be played on Estadio Municipal de Anoeta on Sunday, 4 November, as expecting an equal match in San Sebastian. Below we will offer you our soccer betting tips for this game. Real Sociedad’s team scored a third consecutive match without success after a 1:1 draw on Chelsea in a match of the King’s Cup tournament on Thursday. In the previous round Real Sociedad retreated as a guest at Atletico Madrid with 0:2. Before that, the Basques made a zero draw on their own terrain against Girona’s team. Real Sociedad continues to have no victory over its own season this season by registering two draws and two losses. In their first home on September 15, the Basques were defeated by Barcelona 2:1, and then made a 2:2 draw against Rayo Vallecano. On September 29, the “blue-and-white” retreated with Valencia’s 0:1 minimum, and then came a draw against Girona. Will Real Sociedad put an end to the series without the victory of Estadio Municipal de Anoeta, or will Sevilla guests consolidate their ambitions for a place in the top of the standings? The visitors occupy the 4th position with a 19-point asset but have a match less than the second-placed Atletico Madrid, which has 20 points in its assets. Sevilla recorded a 2-1 win over Huesca in the last round as it was their fourth win in the last five games at La Liga. Sevilla has won three of his five league leagues this season by scoring four of these games. The team recorded victories with 6:2 against Levante and 4:1 against Rayo Vallecano, and beat Eibar with 3:1. Sevilla proved to be able to beat the teams in the second half and I think Pablo Machin is quite likely to win his upcoming visit to Real Sociedad, who registers hesitating results on his own pitch this season. Almeria hosts Las Palmas in a ninth round of the Segunda Division. The meeting will be held on Saturday, October 13, at the Estadio de los Juegos Mediterraneos in Almeria. The international break does not affect the Spanish second division Segunda Division and La Liga’s battles continue to take full effect this weekend. Las Palmas is one of the teams claiming a place in the elite next season after dropping out of the Primera Division this year. The visitors are third in the provisional standings with a 15-point asset, while the Almeria team has ten points in its assets and occupies the 11th place. In the last round, the Almeria team lost their visit to Cordoba with 0:1, putting an end to their series of four consecutive wins. The winning series of hosts started with a 2-1 win on the Malaga field in a match of the Spanish Cup tournament on September 11th. After that, Real Zaragoza, Numancia and Reus Deportiu were defeated in the league, with Almeria making a major breakthrough in the league and only four points from sixth. Francisco Fernandez’s graduates have two wins, one draw and one loss in their four home games this season, and will be looking for a third consecutive success of Estadio de los Juegos Mediterraneos against Las Palmas. Las Palmas’ team is lagging behind four points by leader Malaga, saying he has done quite well so far. Gran Canaria fans have won three of their last five games in the league, but in their previous two matches they failed to score a goal and scored only one point. Las Palmas has one win in three away games in the Segunda Division and has won four points. In their last visit to Sporting Gijon, they failed to score a goal and lost 0-1, but I think they will perform better against Almeria and will not defeat. Olympiacos has more experience than Bethes in Europe, but this is not a guarantee of success. Read our football predictions for today, below. Olympiacos was dropped from the top in the Greek Championship last season and retired AEK’s first place. The team will now compete in the Europa League after last season’s participation in the Champions League. In his last League in Europe two seasons ago, Olympiakos came to the final table and dropped out of Besiktas. The Greek Grand Prix has already overtaken Lucerne and Burnley to qualify for the group stage. The new season in the Greek Championship also started well and has three consecutive wins from the first three rounds. Just five seasons ago was Betis’ last participation in Europe. Then the team played in the Europa League and performed well, but at the end of the season, the team was eliminated dramatic by the city rival Sevilla. Last season “green and white” performed well in the Spanish Championship, which now secured them direct participation in the tournament groups. The first match of the Betis season did not start well and they beat a home defeat by Levante 0:3. Apparently they later took a lesson because then they did not score a goal in the next two rounds where they faced serious teams such as Seville and Valencia. But worrying is that Betis has scored just one goal for the first 4 rounds in Spain. The experienced team of Olympiakos will look to take advantage of his household and reach a win. Betis, however, will also look for his own, as he is also a favorite in Milan. Guests must work on their effectiveness in attack after the defense has performed well in their last three games. There are views that there are not many goals in the match and this will be our first choice for a bet here. Olympiacos may not lose, but we will consider equality as the second choice for this match. Sevilla faces Getafe in a match of the Spanish La Liga‘s fourth round. The match will be held this Sunday, September 16, by Estadio Ramon Sanchez Pisjuan as the hosts enter with ambitions for the three points, but guests from Madrid can be quite inconvenient opponent. We can not say that Sevilla started a strong season 2018/19, but the hosts are fifth in the standings. Sevilla has scored victory, draw and loss since the start of the season and has a four-point asset. The hosts are one of the best defending teams, having scored only two goals and four goals at the same time. Sevilla lost the derby with Real Betis in the last round with 0:1. The defeat of midfielder Roque Mesa in the middle of the second half influenced this defeat. Betis took the initiative, and with Joaquin in the 80th minute he won the Sevilla derby, which is one of the most challenged in Spanish football. Otherwise, Sevilla performed much better and beat Rayo Vallecano 4-1 in the first round, and in his second match Villarreal made a zero draw. Getafe also has four points in his asset, but is ninth in the table. The guests are impressed with their defense and there are only two goals allowed, which suggests that this could be a game with a few hits. Getafe made a zero draw against Real Valladolid in his last game in the league, and a round before Eibar beat 2-0 on his own ground. In their first match for the season, the guests were unable to resist Real Madrid and lost Bernabeu 0-2. Last season, Sevilla scored a 1:1 draw against Getafe on their own pitch, and on a Madrid tour they won 1-0. In the last three meetings between these two teams, only five goals fell, making an average of just over 1.5 per game. Given Sevilla and Getafe’s good defense at the start of this season, you can bet on under 2.5 goals in the match, with the odds for under 3.5 goals not bad. Cyprus hosts Slovenia in the second round of Group 3 of League C of the UEFA Nations League. The meeting will be held on Sunday, September 9, at the Neo GSP stadium in Nicosia. The two teams are in this group together with the national selections of Bulgaria and Norway. Cyprus kicked off the tournament with a defeat of 0:2 as a guest of Norway, this being the fourth loss in the last five games for the hosts. Slovenia also failed to score and defeated home from Bulgaria with 1:2 – their third loss in the last four games. The Cyprus team could not oppose Norway on Thursday night in Oslo. The Cypriots allowed two goals to the rest, and in the second half they did not even reach an honor goal. Ran Ben Shimon’s graduates will need to show a better game in their home team if they want to be out of the loser again. In the World Cup qualifiers 2018, Cyprus recorded two wins, one draw and two losses on their own field. The team dealt with Gibraltar (3:1) and Bosnia-Herzegovina (3:2), while losing to Belgium (0:3) and Greece (1:2). The Slovenian team was the favorite in the first round against Bulgaria, but it was empty-handed to its own audience. The Bulgarian team takes advantage of their few chances of a shot, while the pressure of Slovenia for most of the game led to only one goal. In March, Slovenia suffered a 0-0 loss from Belarusian (0:3) and Belarusian (0:2) friendly matches, which shows that they are not in very good shape lately. In my opinion, it will not be easy for the guests to win at Nicosia, and the even result seems a very likely outcome for this match. Cyprus is not amongst the most stable hosts, but can oppose the Slovenians and both teams are able to share one point. Thats our’s football betting tips for today. Italy hosts Poland in a match from the UEFA Nations League. The duel is on Friday, September 7, at the Renato Dall’Ara stadium in Bologna. The Italian nation was bitter after the national team failed to qualify for the World Cup 2018. Gian Piero Ventura left the post of senior coach and Roberto Mancini was appointed to his post. Now, the big question is, is Manchester City’s former coach able to return the old team’s old glory. Mancini also has a solid experience as a mentor of clubs in the Italian championship, so he knows the qualities of the players. Almost all players for the upcoming matches with Poland and Portugal from the UEFA Nations League are from Serie A, giving the impression of three Chelsea players – Davide Zappacosta, Emerson Palmieri and Jorginho as well as French striker Mario Balotelli. All the other players play in Calcio and are accustomed to the style of play imposed by the Italian team. In the summer, Italy played three controls, starting with a 2:1 success against Saudi Arabia. Then Roberto Mancini lost 1:3 from France and in his last check he made a 1:1 draw against Netherlands. Italy has problems in defense and has not kept a dry network in its last five games, so it seems quite likely that the national team of Poland will take advantage of their defenses in defense. Poland ended its participation in the World Cup 2018 with a victory after the last round of the group stage defeated Japan by 1:0. Previously, the Polish team lost from Colombia (1:2) and Senegal (1:2). Poland has performed quite a bit as a guest in the world qualifications, recording three wins, one draw and one loss. The Poles have scored 13 goals in their five away games, so I expect to scrap against Italy. On the other hand, the hosts have a lot of class players offensive like Mario Balotelli, Ciro Immobile and Lorenzo Insigne, so we should see goals in both doors at this meeting. Good luck with our single football predictions! Monaco may also have difficulty against Marseille. We will try to find best soccer predictions for this derby. The champion of two years ago continued to sell his best players. So far, he has managed to find alternates and fix the situation, but this may not be the case in the current season. The promising Russian talent Alexander Golovin was attracted by CSKA Moscow but still injured and could not make his debut. It is expected the return of Stefan Jovatich, who missed the last game due to trauma. “The Monegasque” started with a 3:1 win as a guest of Nantes, but in the next two rounds they were not at the level. First, they only turned 0:0 home against Lille, and last week they lost a 1:2 loss to Bordeaux. Marseille started the season with a stylish 4:0 victory over Toulouse. Following her was a surprising loss of 1:3 as a guest of the newcomer Nim. In the last round, Marseille made it to a 2-2 draw against Reven after losing 0-2 at half time. Dimitri Piett failed to play in the World Cup, but is already in line and scored two goals since the season. Another French national Frolan Taven also made two hits in the first three rounds. Monaco won a 6:1 home in Marseille last season. Moreover, the “Monegasque” have 5 consecutive wins at home of this opponent and Marseille has not won here since 2010. Monaco is also 7 games in a row without a loss from Marseille. Now the hosts seem to have an idea weakened after the sale of key players, but Marseille was not at the level in the last two rounds. There are also the prerequisites for goals in the match and we expect to see hits in both doors, as is often the case in their recent games. Juventus’ A Serie Champion Launches Season 2018/19 with Chievo on Saturday. This is also the first match for the new campaign, with Torino guests being the favorites of Stadio Marc’Antonio Bentegodi’s victory. Juventus tossed the transfer bomb this summer after taking on one of the world’s best players Cristiano Ronaldo. Many football experts already believe the club is ready to win the Champions League after a bunch of missed chances in recent years. By attracting Ronaldo, Juventus’ dominance in the Italian Championship is almost unquestionable. Juve had a Napoli competition last season, while Inter is now supposed to claim the title, but most likely the Old Lady will pick up Scudetto in May 2019. Juventus has also boosted other class players such as Leonardo Bonucci, Emre Can and Mattia Perin as Max Allegri’s team mentor can count on them in the upcoming match. Juventus lost to Real Madrid 1:3 in its last control on August 5, and it’s been two weeks since. Previously, Max Allegri alumni made a draw with the MLS All-Stars team. Juventus finished last season with two victories in its last five away games. Massimiliano Allegri hopes his team will start the new season with a win and a rival like Chievo should not bother the champions. Chievo’s team finished last season in 13th place, winning 10 of their 38 games. In their last five home games, the team recorded two wins, two draws and one loss. Chievo retained two dry nets for this period, but is unlikely to miss Saturday night. Juventus won 2-0 on his last visit to Stadio Marc’Antonio Bentegodi, and previously recorded a 3-0 home win. In my opinion, Massimiliano Allegri’s boys will again win with at least two goals difference and will start the new season with three points. Udinese hosts Benevento in a third round of the Coppa Italia tournament. The duel is on Saturday, August 11, at the Dacia Arena stadium, where the hosts are favorites for winning and ranking in the next phase of the race. Part of the elite teams in Italy started their participation in the Third Round Cup. This week will play 16 matches from the third round of the Cup tournament as this is one of the most interesting games. A week before the start of the season in the A Serie, Udinese hosts one of the members of the elite of the past Benevento campaign. The guests, however, could not cope with the life of the elite and fell out, now seeking to return to the A Series and make a good performance in the Coppa Italia. Benevento started his tournament last Sunday, winning the second round with 3:1 Imolese. Last season Benevento dropped into the third round of the tournament after a heavy defeat from Perugia with 0:4. The guests were in a row of four consecutive losses in this race but broke their unpleasant series with success over Imolese a week ago. Now, however, they have a much more difficult task and they are in the role of an outsider on their Dacia Arena visit. This will be the first official match for Udinese for the season 2018/19 and the fans hope to win. Defeating the Cup in a second division team will be a disappointment for the hosts. Udinese lost 1:2 from Hannover 96 in its last control, and previously recorded three wins and one draw during their pre-season preparation. Julio Velazquez’s team defeated Leicester City 2-1 in the summer and in a lot of matches demonstrated a good attack game. New addition Darwin Machis, who scored 14 goals for Granada last season, will be Udinese’s leading striker in the new season and the Venezuelan footballer will be able to prove this weekend. Udinese has a lot of experienced and classy players like Valon Behrami and Thomas Heurtaux, so the hosts should win this game. Good luck with our soccer betting tips for today! Spartak Subotica hosts Brondby at a third round of the Europa League tournament. The duel is on 9 August, Thursday, at the Rajko Mitic stadium in Beograd. Read our winning soccer tips for this game below. A lot of football specialists were surprised by the Spartak Subotica ranking for the third qualifying round of the Europa League. The Serbian team eliminated Sparta Praha’s favorites as the favorite team with a total score of 3:2. Spartak Subotica recorded an important home win 2-0, which proved decisive for the final outcome. The team from Serbia scored a goal on a foreign field and despite the 1:2 loss in Prague continued in the next round. Now Spartak Subotica is back in the role of an outsider against the Danish Brondby, but once again proved to be able to surprise the European scene. The hosts, however, are not in good shape by losing their last three games in all the tournaments. Over the weekend Spartak retreated with Proleter Novi Sad 0-4 at the Serbian championship. To some extent, this loss has its logical explanation after many of the players have been given a break to be fresh for the important match with Brondby. Is the Spartak Subotica team able to play a strong home game at home in Europe again, or will Danish rivals tilt the balance to their advantage? Brondby’s team touched the title last season, but failed at the end of the season when he visited Horsens (2:2), and before losing Midtjylland with 0:1 on his own pitch. The “yellow-blue” started the new season in the Danish Superliga, being the first in the league with ten points in four games. Now Brondby will start his participation in the Europa League from the third preliminary round and the team hopes for a strong performance in the tournament. I think the Danish team is more classy and will show it in the first match as it is quite likely to reach the victory in Beograd. Gornik Zabrze welcomes Trencin in a match from the second Preliminary Round of the Europa League. The match will be played on Thursday evening at Arena Zabrze in Zabrze. Gornik Zabrze successfully started his participation in the Europa League this season after eliminating Moldovan FC Zaria Balti in the first qualifying round. The Poles won the first home game with 1:0 and on the rematch they made a 1:1 draw and so they qualified for the next phase. Over the weekend, Gornik Zabrze made a second straight draw after a 1:1 home win against the Korona Kielce team at the start of the Polish Championship. Now they will play again at Arena Zabrze, and this time the fans will be expecting a victory over the Trencin team. Last season Trencin finished fifth in the final standings, but won the Europa League barricades as a contest in the tournament to beat Zilina 2:1 after extra time. So the Trencin team for the third consecutive year participated in the Europa League and did well in the first qualifying round. The Slovakian representative withdrew Buducnost with a total score of 3:1. Last season Trencin dropped out of Bnei Yehuda in the second preliminary round, but now Ricardo Moniz boys will try to reach at least one round further. Trencin has no bad chances against the Polish Gornik Zabrze, who is still a favorite at the first date. Gornik Zabrze allowed a goal in his last three games as he did not show a very good defense game. In the previous match of Trencin against Buducnost we also saw a goal exchange. I think in the upcoming match we will see hits in both doors, because both teams are not solid in defense, as of last season. Otherwise Gornik Zabrze has only one loss in his last nine official games on his own field so he seems unlikely to lose on Thursday night. Kalmar faces GIF Sundsvall in a match of the 14th round of Swedish Allsvenskan Football Championship. The Guldfageln Arena is on Saturday, July 21, with the hosts being the favorites of the victory. Kalmar’s team is in sixth place in the standings and has ambitions to take part in the Europa League next season. The hosts have 20 points to their name by lagging at seven points in the Top 3. Kalmar must improve his performance if he wants to fight for a place in the top of the rankings. The team has only one victory in their last five games in the championship. This success was 3:1 on the field of IFK Goteborg two weeks ago. In the last round, Kalmar lost to Djurgarden 0:1. This was a second straight match without success for their own audience, but now they have the opportunity to return to the winning route against a weaker rival. Team GIF Sundsvall is ranked tenth in the standings with an asset of 18 points. The difference to the sixth place is not great, so if they succeed in this game they can progress in the ranking. GIF Sundsvall, however, lost his last two games in the league with no goal scored. Last Sunday, the team retreated to the leader of AIK Solna with 0:1, and on his last visit he lost heavily with 0:3 from Hacken. In his last four Sundsvall matches, he has three losses and will aim to avoid a defeat on Saturday at the Guldfageln Arena. Kalmar is in a series of three consecutive victories against the rival, with a goal difference of 8-1 in their favor. This is another reason for the hosts to be the favorites at the upcoming 14th round of Allsvenskan. I think the Kalmar team will be at the level of their fans and will congratulate themselves on the victory that will bring them closer to the top 3. The national selections of Germany and Sweden go against each other in a match of the second round of group F at the World Cup 2018. The duel is on June 23, Saturday at the Olimpiyskiy Stadion Fisht in Sochi. World Champion Germany started with a false start at the World Championship in Russia. Joachim Low’s teammates lost 0-1 from Mexico on Sunday in Moscow and will now be the first to win the tournament against Sweden, which beat the Republic of Korea by 1-0. Sweden’s team is now in a much more favorable position and will try not to lose, which can bring them closer to the 1/8-finals. Germany’s team, however, remains the big favorite of the victory and one of the first two places in the group despite the defeat of the start of Mexico. Almost nothing happened in Germany’s game against “El Tri” at the Luzhniki stadium in Moscow. Joachim Low’s boys will want to forget this meeting and set themselves as if the World Cup is just starting out for them. The Bundestim, however, is pressed against the wall and needs two wins to continue the 1/8-finals. The last three world champions were eliminated in the group stage, defending their title, so the Germans certainly do not want that fate to happen to them. Joachim Loew will be strongly criticized for some of his decisions if Germany fails in Russia. As it is known, the specialist left the young star of German national team Leroy Sane out of the league. His lack felt in the first match against the Mexicans. Germany’s team was rather slow at times and there was no player to raise the pace. Marco Reus appeared after the break but could not help his team. Timo Werner and Julian Draxler, however, have been disappointed, but they have to be at a better level in the match against Sweden on June 23. Sweden’s team did not win in their last four games before the start of the World Cup 2018, but they started their best in the world finals. The Janne Andersson alumina was brought down by Andreas Granqvist in the 65th minute. Sweden has traditionally played strong in defense and in its last three official matches has already missed a goal, including the two matches with Italy from the World Championship World Cup qualifiers. Sweden finished second in its qualifying group and then knocked down Italy to book their tickets for the Mondiale 2018. Janne Andersson’s self-confidence picked up the tournament and with a lot of patience managed to make a victory against the Republic of Korea. Everyone in the squad is aware that they now have a very heavy game against Germany. However, the tension will be entirely on their rival, who failed in the first match and Sweden already has three points and can only win from this match. After losing to Mexico last Sunday, now Germany has only one win in its last seven games. This was a 2-1 win against Saudi Arabia, which is even a poor result for the world champion’s standards. Germany lost to Austria and Brazil in controls in March. Joachim Loew will have to raise the team because the team should be at the top of their chances to win against Sweden. Given the results of the Bundesteam, we can safely talk about a crisis in their camp. However, I expect them to show their championship mentality and to record the first win of the World Cup 2018 to maintain excellent chances of being placed in the phase of direct elimination. Panama World Cup debutant kicked off a match against Belgium. The two teams are in group G, where are still the teams of England and Tunisia. Panama’s task is definitely going to be quite complicated as it faces a rather stable team full of stars. The meeting will be played at the Sochi stadium and promises to be quite curious. When it comes to the Belgian national team in recent years, it is always commented on the golden generation that is currently filling the lineup. This generation has now passed through two major forums – Mondiale 2014 and Euro 2016. The current World Cup is one of the great stars of Belgium and it is here that the team is expected to show the class and good performance that will be the result of the experience. The Red Devils scored strong controls before the start of the World Cup, winning 3 out of 4 games and once they ended in a draw. In their last match, the team won 4-1 over Costa Rica. Vansan Compani is under questioning for the match, with the chances of the experienced defender to take part in the match are not big. At this meeting you can find top odds on the Pinnacle site where all the World Cup matches are available. The North American country is for the first time at the World Cup Finals. The ranking was a great success for Panama, but for the sake of fact the team was not very lucky at the draw and fell into a rather tough group where Belgium and England are favorites for the top two places. Panama played 5 controls this year, recording 3 losses, 1 win and 1 draw. In their last friendly match Los Canaleros lost little from Norway. There are no problems with injured players in the camp of Panama. There is no question that Belgium is the big favorite at this meeting. On paper, Panama has no chance of success here, and anything but a victory for the Reds would be a surprise. History adds even more truth to this statement. After losing to Mexico in the 1982 group stage, Belgium is in a series of 11 games without defeat against teams from North America, winning 9 of them and 2 times ending in a draw. Panama has had 9 meetings with European teams in which it recorded 4 draws and 5 losses. The upcoming meeting will be the first between the two nations. Our opinion is that Belgium will sign a strong start and will win this meeting without any difficulty, as we expect a lot of hits in the game. We predict the combination of success for Belgium and over 2.5 goals. Brazil is the most successful state of the world finals. “Celessao” has not missed a World Championship so far for the 21st time as the world’s largest football forum. Brazil has five world titles and will try to win its sixth World Cup in Russia. For the first time the Brazilian national team won the title in Sweden in 1958. Led by the great Pele, who scored two goals in the final against hosts of the tournament, Brazil won 5-2 and raises the World Cup. Four years later, they won the finals in Chile, and their next triumph was in Mexico in 1970, when Pele is again among the top scorers in the final match against Italy (4:1). In 1994 in the United States, Brazil’s national team returned to the world top, and in the next two tournaments won second place in France and won the title in 2002 in Japan and South Korea. At the last World Cup in 2014, the Brazilian hosts ranked fourth, after dropping out of Germany at the 1/2-finals and losing the match to third place with the Netherlands. Brazil came into Group E at the World Finals with the national selections of Switzerland, Costa Rica and Serbia. Brazil had no problems with its world championship. Selesao finished convincingly in the South American zone with 12 wins, 5 draws and 1 defeat in the qualifying campaign. They gathered 41 points in their assets while the second Uruguay finished 31 points. Brazil showed a very strong attack and good defense on their way to the Mondiale 2018. They scored 2.27 goals per game in the qualifiers on average, and only allowed 11 hits in 18 games, although they had very strong rivals like Argentina, Uruguay and Chile. 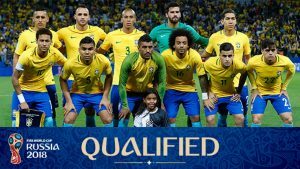 Brazil has proven to be the strongest South American team in the World Cup qualifying campaign 2018, and we are going to see how they will perform at the finals in Russia and whether they can handle the strong European countries. The Brazilian team plays fast and offensive football. “Caryotes” have always bet on this style of play. They are one of the best attacking nations in the world and that has not changed over the years. Brazil currently has players like Neimar, Firmino, Coyutinho, and Douglas Kosta in the top position – many class and fast players. Besides, the strength of the team is on the wing, where he has backsets like Marcello and Danny Alves. “Celestao” will aim to hold the ball and lead the game even when faced with stronger teams. Not for a moment they did not fall into a defensive defense of a 1: 7 defeat from Germany four years ago at the ?-finals of the World Cup 2014, which suggests that they are not a team that defends itself, even if it faces losing with great results. They took over the Brazilian national team in June 2016 and the results of the team are very good under his leadership. Prior to taking the lead in the field, the 56-year-old has a rich business card and has led over 10 different clubs. For the last time, he was at the head of Corinthians, but in 2016 he left the team to take over Brazil. In 2012, Titans made something remarkable, as his Corinthians beat Chelsea 1-0 in the final of the World Club Championship. This is his greatest success as a coach. But now he will want something more with Brazil – the World Cup. In 2017, under the leadership of Tite, Brazil recorded seven wins, three draws and one defeat and won convincingly the World Cup qualifiers for 2018 in South America. Neymar is the big star of the Brazilian national team and his compatriots expect to lead the country to the sixth title of the world finals. Football player Paris Saint-Germain has 53 goals in 83 matches for the national team by April this year. In the 2014 World Cup, Neymar has four goals, but the Russian championship will try to improve this achievement and we think he is capable of doing so. Brazil’s outstanding team and many people expect from the “seleaso” to win the World Cup 2018. Fulham and Darby County teams go against each other in a match rematch from the Premier League playoffs. Both teams ranked in the top 6 in the Championship and thus secured the chance for promotion in the elite. Darby County took an advance in the first match after a 1:0 success, but now everything will be decided at Craven Cottage on Monday night. Fulham’s team definitely beat their rival in the first game, but even failed to score a shot and now will have to be very careful on the rematch. Slavisa Jokanovic’s graduates finished third in the regular season and were only one win in the last round of the Premier League. Now they seem pretty close to the start of the playoffs and if they fail to settle their pass through a goal against Derby County, they will be eliminated on the 1/2-finals of the Premier League barracks for the 2018/19 season. Fulham’s team was one of the best hosts in the Championship season. Londoners won 57% of their matches on their own pitch. They scored 40 goals for 23 home games and only scored 17 goals in their goal. Now they will have to show a good game at Craven Cottage again, otherwise they will forgive their dream of returning to the Premier League. The Derby County visitors entered the playoffs as the sixth at the end of the season and stood up against the strongest rival. They managed to score a very good result in the first game and they know very well how important it is not to score a goal on their own field. Darby County won 35% of their matches on a foreign field this season, scoring 29 goals and 26 hits. In their last visit to Fulham, they made a draw 1:1 and now this result will make them continue to the final playoff. In my opinion, however, this time Slavisa Jokanovic will be able to score and Fulham will win the match, but we have yet to see whether the success will qualify for the final of the playoffs. Good luck with our soccer bet predictions above ! Borussia Dortmund will not leave Mainz chances at home . Read our Football single predictions below. The upcoming 33rd round of the current season of the German First Bundesliga is coming. In one of the matches we will see the clash between the teams of Borussia Dortmund and Mainz 05. The hosts are in the third position with 55 points, while Mainz is 14th with 33 points. Borussia Dortmund is still not quite sure about his top four place. The team will have to win at least a point in order to secure their place in the four. The “yellow and black” will fight for her in the upcoming match. In the previous round, Borussia recorded 1-1 when it was a visit to Werder Bremen. The team has 3 wins, 2 losses and 1 draw in 6 games and home with 4 consecutive wins. Batshuay and Royce miss this meeting. Dourm, Sigdou, Royce and Gereiro are in question. Before you bet on this game, you can look at our overview of the various Winbet bonus codes that you can earn additional funds on the bookmaker site. The situation at Mainz 05 is such that the team can still get into the danger zone. The team will have to work to win at least a point that will provide him with a place outside the area of ? ?the direct fallen, but the point will not be enough to ensure survival. Mainz will still be able to finish the 16th and play a playoff. The team scored 3-0 in the last round against RB Leipzig. A total of 2 wins, 2 draws and 2 losses for the team at its closest 6 games. Far from home, however, Mainz has 3 defeats and 1 success in his last 6 games. Balogon, Serrad, de Blasis and Berggren are questioned about their participation in this meeting. The first meeting between them in the campaign ended Borussia with a score of 0-2. The team is in a series of 6 games without losing to Mainz in the league, in that period recorded 5 wins, and one game ends in a draw. In addition, the “yellow and black” have no home loss against Mainz in the Bundesliga. In 11 games they have recorded 7 wins and 4 draws. Both teams will pursue the points in this game, but we think only one will get to them. Borussia Dortmund will have to consolidate his place in the four, so the team goes out to win. Mainz will also look for the victory, so we think there will be a lot of hits in the game. We predict the combination of a win for Dortmund and over 2.5 goals in the match. United will deal with Arsenal at home who will think of EUROPA LEAGUE. We offer you soccer single predictions for that derby ! The Derby Circle in the English Premier League opposes the Manchester United and Arsenal teams. The hosts of Manchester are second with 74 points, while the gunmen are the sixth with 57 points. Both teams have a passive match. In their last 6 games, the Red Devils suffered only one defeat, which came surprisingly home from UBA with 0-1. Manchester United won their other 5 games in this period. In the previous weekend, the team faced Tottenham in a semi-final match for the FA Cup and won 2-1, thus securing a place in the semifinals. United will aim to keep second at the end of the season. Sergio Romero is in question about the match. Live betting opportunities at this event can be found on the Bwin site, where you can even watch live matches. The fate of Arsenal this season puts him away from the top 4, which is definitely a minus for the team. The big goal is League Europe, but during the week the “balls” recorded a very poor result in their first home match against Atletico Madrid. The match ended 1-1, with Arsenal having 2 draws in its last 6 games. In this period he recorded 3 more victories and 1 defeat. Elveni, Casorla and Mihtirian are out for this clash. Premier League’s history remembers 51 clashes between them, with 23 wins for United and 13 successes in favor of Arsenal. The game has an extra charge because Arsene Wenger leaves after the season and this is likely to be his last clash against United at Arsenal. In his direct battles against Jose Mourinho he has only two wins, while the Portuguese has scored 9 successes. Earlier in the season United won 1-3 with Emirates. Arsenal has the bigger problems before this game. The goal of the team is the Europa League, and next week there will be a heavy and decisive visit to Madrid. Manchester United will definitely be more relaxed for this match and we think the team will win. Our forecast for the match is the combination of a win for United and under 3.5 goals. The Southampton and Chelsea teams have begun the 34th round of the Premier League. The meeting is on Saturday, April 14, at the “St. Mary’s Stadium” stadium. Hosts from Southampton are seriously threatened to drop out of the Premier League after several rounds before the end of the season are in 18th place in the standings with 28 points. “The Saints” are three points out of the rescue zone having a less than 17th match in the Crystal Palace team table. In the last round, Southampton lost 2:3 as Arsenal’s host, a second defeat for the team. A week earlier they lost 0:3 again in London against West Ham. In his last home game in the Southampton League he made 0: 0 against Stoke City, after which he had three consecutive wins and three defeats. Meanwhile, the team is on a 1/2-final in the FA Cup, where they will play against Chelsea on April 22 and this game will be a great test for them for this important meeting. Chelsea’s team is ranked fifth in the Premier League’s standings with a 57-point asset. The “Blue” are ten points for the fourth Tottenham, so they are unlikely to fight for a Champions League spot next season. Antonio Conte’s graduates have won just one of their last five games in the league. In the last round Chelsea made 1:1 home against West Ham as there was an advance in the match and missed a lot of goals for a second goal, and eventually took only a point from the match. In his last visit, Antonio Conte’s team lost Manchester City 0-1. Before that, Chelsea defeated Manchester United (1:2) and Watford (1:4). The team’s last success away from home in the Premier League was 4:0 over Brighton on January 20th. I think it’s high time Chelsea to win again as a guest, and the “blue” will congratulate her on this match. Roma hosts Fiorentina in a match of the 31st round of the Serie A. The meeting is this Saturday at Stadio Olimpico, with the hosts needing the three points to consolidate their place in the Top 4. The Roma team is ranked third in the standings with 60 points, with one more than the fourth Inter and three at the 5th Lazio. The Wolves have had 18 wins, 6 draws and 6 losses since the start of the season, having scored 50 goals and 24 in their doors. Their upcoming rival, Fiorentina, is in ninth place with 47 points as the teams of Atalanta and Sampdoria have in front of them. The “Violets” are four points behind the sixth Milan, so they have good chances to be in the Europa League. The guests have scored 13 wins in their 30 games so far, with nine defeats. On Wednesday, the Roma team lost 1:4 as Barcelona’s guest in the first match of the 1/4-finals of the Champions League. After this result, the “wolves” have little chance of ranking the 1/2-finals. However, Roma has performed well on Camp Nou with a slap to score two goals. The defeat from Barcelona was first of February 25, when Roma backed AC Milan with 0:2 at home. In their last championship, Eusebio di Francesco’s graduates made 1: 1 on the Bologna pitch and had three consecutive wins, including 4:2 over Napoli’s San Paolo. The guests from Florence have been in their best shape since the beginning of the season. Fiorentina won her last five games in the “A” series with only one hit for this period. In the last round, the “violets” beat Udinese with 2:0 as guests and before that they took the three points against Croton at home after a 2-0 win. Fiorentina will try to take advantage of the fatigue in the hosts and I think at least one goal in the match and the hosts from Roma should also write because they have not scored a goal in just three of their last 46 matches “Stadio Olimpico”. Middlesbrough hosted Wolverhampton in the most interesting match of the 39th round of the Championship. The match is on Friday, March 30, opposing one against the other six and the first in the standings. Middlesbrough’s team recorded four wins and two draws in their last six league games. These good results returned the team to the battle for entry into the Premier League. Currently the hosts are in sixth position with a 62-point asset, with only one advance ahead of the seventh Bristol City. In the last round, Middlesbrough made 1:1 as a guest at Brentford, expecting it to be a hard game for Tony Pulis graduates. In his last home game Middlesbrough beat Barnsley 3:1 to record a fourth straight home win. “The Boro” has made 11 goals in its last four matches at the Riverside Stadium, so for Wolverhampton leader this will be a tough test. The Wolves have a comfortable six-point lead in front of Cardiff’s second goal and 13 points more than the third Fulham. It is a matter of time for Wolves to return to the Premier League. Of course guests will want to win the championship so they will not be relaxed until the end of the season. Earlier this month, they suffered a heavy 1:3 defeat at Aston Villa, but then scored two home wins over Redding (3:0) and Burton Albion (3:1). In their last six visits, Wolverhampton scored two wins, two draws and two losses. They also defeated Fulham, who is third in the standings. In three of the fights, the “wolves” did not get a shot, but now they face a team in perfect shape and will find it difficult to keep a dry net. At their last visit to Riverside Stadium, Wolverhampton lost 1:2 March 2016. “Wolves” have only 4 wins in 34 matches at this stadium, so historically they perform poorly against Middlesbrough away from home and are quite likely to defeat on Friday. Chelsea’s team welcomes Crystal Palace in a match of the 30th round of the English Premier League. The match is on Saturday at Stamford Bridge. The hosts rank fifth in the standings of the 53-point championship. Chelsea is five points behind Tottenham and by the end of the season the champions will struggle to find a place in the Top 4. However, it is very important for the team of Antonio Conte to play in the Champions League as on Wednesday Chelsea is coming to Barcelona in a match rematch of 1 / 8-finals. It is very likely that the Italian host manager will give a break to some of the major players in the match against Crystal Palace. In the last round Chelsea lost 0:1 from Manchester City to Etihad Stadium. This was the second consecutive defeat for the team after a week earlier they retreated Manchester United 1:2 at Old Trafford. So in both Manchester City visits, the “blue” of London did not even get a point. In their previous five Premier League games, the team has only one win and four losses, and this statistic is quite unpleasant. In their last five home games, things look a little better for Chelsea as they have scored three wins, one draw and one defeat. In their last home game, Antonio Cotete’s fans beat West Bromwich 3-0, but before they were beat by Bournemouth with 3:0, so their performance is contradictory. Crystal Palace defeated Chelsea earlier this season by winning a 2-1 victory at Selhurst Park. The Eagles currently do not perform well after being in the 18th position. Crystal Palace won only two points in its last six games in the Premier League. Roy Hodgson’s graduates are in a series of three consecutive losses, with Manchester United 2:3 in their last match, despite having a two-goal lead. In my opinion, this defeat will have had a pretty bad mental effect for Crystal Palace players and they will also lose against Chelsea. Milan hosts Arsenal in the big clash of the 1/8-finals in Europa League. On March 8, Thursday, Stadio San Siro is the first match between the two teams. The bet for both teams is enormous as they aspire to win a Champions League season next season and the easiest option at the moment seems to win the Europa League. Both Milan and Arsenal are lagging behind the top 4 in their championships. Rosoneries are seventh in Series A at eight points in the fourth position, while Arsenal’s team is in sixth position in the Premier League with 13 points behind the fourth Tottenham. The guests from London are in very weak form as they are currently in a series of four consecutive losses. Over the weekend, Arsenal lost 1-1 to Brighton as a guest in the Premier League, and that defeat ended their chances for a place in the four. Neither Arsenal Wenger will be able to make 13 points on Tottenham Hotspur after the spurs are very stable. The bad series of Londoners started with Jostersund defeat 1:2 in the rematch of the 1/16-finals of the Europa League, followed by two defeats from Manchester City with 0:3. Milan’s performance is fundamentally opposite to that of Arsenal. “Rossonerri” are in a series of 13 games without injuries in all tournaments. In their last six games, Gennaro Gatuzo’s team has not made a shot and will be a real challenge for Arsenal’s attack to overcome the opponent’s defense. Over the weekend, the AC Milan team did not have a match and would be fresher than Arsenal. The reason was the death of Fiorentina’s captain Davide Astori as all A-series fights were postponed. Milan thus returned to the field for the first time after removing Lazio from penalties at the end of February at the finals for the Italian Cup and I think the hosts should win against Arsenal’s hesitating team. Valencia – Betis , Vip soccer predictions for it. Valencia meets Betis in a match of the 27th round of “Primera Division”. The match is on March 4, at the Estadio Mestaja stadium in Valencia. Hosts from Valencia ranked fourth in the standings with a 50-point score behind only one of the third Real Madrid. In the week, the “bats” could overtake Real’s team but failed to defeat Athletic Bilbao as a guest and only reached a point after San Diego’s 1-1 draw. Valencia remained undefeated in the league’s fourth consecutive win its previous three meetings. In their last home, Marseilio’s graduates beat Real Sociedad with a 2-1 win and will now have a new victory. Valencia has one of the most successful La Liga attacks after having scored 50 goals for 26 games. When they face Betty’s defense, which has made 50 hits, they will be pretty confident they can score two or more goals. The scorers scored at least two goals for this rival in eight of the last nine Mestaya matches. however, won their last 2-0 league over Levante, hoping that this time during their visit to Valencia they will have the occasion for joy. The guests are in ninth place in the standings with a 37-point asset and are lagging behind with one of the seventh Aubar. “Green and White” have won 11 of their 26 games so far this season. Bettis has a chance to qualify in the Europa League, but he should not make much mistakes towards the end of the campaign. In the upcoming game, Betis will be without two major players – Antonio Sanabria and Zouhair Feddal who are injured. The hosts have fewer problems in the composition and will be the best at this meeting. I think Valencia will record its 16th victory since the start of season 2017/18 in La Liga, which will consolidate its position in the Top 4. Thats our Vip soccer predictions for that match. Tottenham hosts Crystal Palace in a 28th round of the Premier League. The match is on Sunday at the “South Park” stadium as the team is the favorite to win the three points. Team Tottenham took fifth place in the standings with 52 points. Mauriceio Pochetino, a graduate, is lagging behind with a fourth-placed Chelsea, hoping that after this round, they will be entering Top 4 after the “blue” guest of Manchester United. Tottenham won five of their previous six matches against Crystal Palace and the bookmakers are expecting to rejoice again. The hosts in this match are in the 15th place with 27 points to their name. Crystal Palace has scored 25 goals in 27 rounds, which is quite a bit, and so have only six wins since the season. Still a long time ago, they were at the bottom of the standings, so under the guidance of Roy Hodgson the team made progress. In the upcoming game, Crystal Palace will probably be coming out with a 4-3-3. The hosts are not afraid to play attacking on their own terrain against strong teams. Earlier this season, the Eagles beat Chelsea with a 2-1 win and showed great football against the champions. Crystal Palace, however, has a large number of missing players. Among them are major players such as Wilfried Zaha, Scott Dann, Jason Puncheon Bakary Sako and Ruben Loftus-Cheek. Roy Hodgson is likely to bet on the same starting 11 who started against Everton in the last round when the Eagles lost 1: 3 to Goodison Park. Mauricio Pochetino will not believe his style and Tottenham should be in 4-2-3-1. Of course, at the top of the attack will be Harry Kane, who has 23 goals from the season. Tottenham is defeated in his last nine league matches and will not lose at Sel’st Park. It is more likely that the “spurs” will win the match, and this is likely to happen if Harry Kane has a day. The teams of Watford and Everton are coming out against each other in a 28th round of Premier League. The match is on Sunday at the Victory Road stadium and we will see two teams from the middle of the Premier League table against each other. The hosts are 11th in the standings with 30 points, while the Everton players rank ninth with 34 points. The four-point lead of the “caramel” in front of the “hornets” could be reduced this weekend, but the hosts will have to stand on top of their chances to beat Sam Allardyis. Spain’s new host manager, Havi Garcia, has already scored four games at the head of the team, winning one win, one draw and two losses. Watford’s success under Havi Garcia was more than impressive – 4:1 against Chelsea at home. This result came at the last home of the team and they are hoping to win again. In the last round Watford lost 0:2 from West Ham as a very weak match at London Stade. The hosts are still without a few major players such as Miguel Britos, Kiko Femenias, Tom Cleverley and Christian Kabassele, who remain injured. Everton’s team made a convincing 3:1 victory over Crystal Palace in the last round, consolidating their place in Top 10 in the standings. “Caramelles” won two of their last three games in the league, but these victories were at Goodison Park. Away from home Everton’s home team is in a series of four consecutive losses. This series included Bournemouth, Liverpool, Tottenham and Arsenal, so the team’s schedule was not that easy. Everton has had no success in five consecutive games, scoring just three goals for that period. Watford’s team is very inspired against Chelsea at their last home, and if they repeat their performance, they are likely to win the match. Thats our football betting tips for today. ATHLETIC CLUB VS. SPARTAK MOSCOW ,soccer single predictions . Athletic Bilbao hosts Spartak Moscow in a match rematch of the 1/16-finals in Europa League. The duel is on Thursday night at San Mamas stadium. The hosts did a great job during their visit to Moscow last Thursday. Athletic Bilbao recorded a 3:1 victory and is unlikely to revert to San Mamas overall. Striker Aritz Aduritz scored two hits for the Basque success and continued to bring the team to his back. Spartak Moscow lagged 0:3 on the break, and in the second half Brazilian striker Louise Adriano returned one shot and kept the Russians’ chances of being ahead. Last season Spartak Moscow won the title in Russia but is now third in the Premier League standings. The team from the capital lags behind with eight points from the leader Lokomotiv Moscow. Spartak Moscow did not have a match during the weekend, as the Russian Championship was re-launched in early March. The Spanish “La Liga” is in full swing and may have given advantage to Athletic Bilbao. On Sunday, the Basques lost 0:2 to Atletico Madrid, but this result hardly surprised anyone considering their hard trip to Moscow and the fact that they were visiting one of the strongest teams in Primera. Athletic Bilbao has no defeat in its previous five home games. For this period, the Basques allowed only one goal, with even Real Madrid’s team failing to score a goal. In the group stage of League Europe, Athletic Bilbao recorded two victories and one defeat at San Mamas. In their last home, the Basque beat Hertha 3:2. Jose Angel Siguta’s team is a very tough team to beat when playing at home. Basques have the incredible support of their fans, and I think they will not lose from Spartak Moscow so they will qualify for the 1/8-finals of the Europa League. Thats our soccer single predictions for that game. Juventus hosts Torino in the 25th round derby of the A Series. The meeting is on Sunday, 18 February, at the “Stadio Olimpico Grande Turin”. The Juventus team made 2:2 with Tottenham on Tuesday on their own field in the first match between the two teams of the 1/8-finals of the Champions League. This result can not be described as good for the “bianconers” who failed to make an advance and allowed two goals in their own field. Juventus had excellent chances to score a good win, but Gonzalo Iguain missed a 2-1 win penalty in favor of “Old Lady”. Tottenham generally deserved equality and this result was quite logical. Massimiliano Alleggri’s graduates are now turning their eyes to the A Series.Juventus is in second place in the standings with 62 points, with less than leader Napoli. The Bianconers are in a series of eight consecutive wins and will strive to score nine consecutive successes against Urban rival Torino. They beat their rival with Juventus Stadium 4:0 in the first half and also eliminated it in the Italian Cup. Juventus is in a series of six consecutive wins on a foreign field and is likely to record a new success at “Stadio Olimpico” on Sunday. Torino’s team ranks ninth in the standings with 36 points. The hosts are only two points away from the seventh Milan and are at a point behind the eighth Atalanta. Turin has won three of his last five matches in the A Series with no loss for that period. In the last round the ‘bulls’ beat Udinese with 2:0 at home, before making 1:1 on the field of Sampdoria. Last season, Torino lost to Juventus 1:3. Previously, they retreated 1:4 to their bigger city rival. Turin has only 2 wins in 13 home games against the bikonkers as the guests have rejoiced eight times and I expect to win the three points in this match to confirm their superiority over Turin this season. Chelsea meets Hull City in a FA Cup final 1/8-final. soccersinglebets.com offer you winning soccer prediction below. Chelsea is a top favorite in this match, especially because of the bad shape of Hull City. The visitors are in 22nd place in the Championship and will seek to save themselves from falling into League One by the end of the season. Chelsea is also not in the best shape, but in its last game it shows good football and beat West Bromwich 3-0. In a few days, the “blue” greets Barcelona in the Champions League, so they do not necessarily need a sucker just before that date. In the match against West Bromwich striker Alvaro Morata appeared in play as a reserve, so he is totally healthy and will be in line for the duels with Barcelona. It is very probable that Antonio Conte will leave him on the bench and against Hull City, in order not to risk his condition. Olivier Guru, who has demonstrated a good partnership with Eden Azar against the “thrushes”, will start again. Giulu assisted for one of the Belgian players who played a very strong game and scored two hits in Ben Foster’s door. In FA Cup, Chelsea’s team beat Newcastle after a 3-0 win at Stamford Bridge in the last round, and fans of the Blues are expecting a new convincing success against the second-place Hull City. The guests came to this phase of the tournament after dealing with the Nottingham and Blackburn teams. Chelsea is a much stronger team, and Hull City has a class to oppose it to Stamford Bridge. The Tigers have lost five of their previous six away games in the Championship, as in four of the fights they have failed to write. That’s why we expect Chelsea to win the match and maintain a dry network to qualify for the FA Cup final. No doubt this is the big clash of the 1/8-finals in the Champions League. Two of the strongest teams in the world face each other to determine one of the finalists in the race. Both teams have great footballers who can bring their team to victory. Real Madrid is going to rely on its great star Cristiano Ronaldo, but it will also be very important to present the entire team and especially the other team leaders – Sergio Ramos, Luka Modric and Karim Benzema. On the other hand, Brazilian Neimar will again face the “white ballet”, this time he will not have the support of Lionel Messi and Luis Suarez, but he will partner with equally strong players like Edison Cavani, Marco Verratti and Killian Mbape.Soccersinglebets.com offer you a great review for that game tonight. Real Madrid remained in second place in his group, allowing Tottenham to win first place. So Zinedine Zidane’s team could not expect a slight rival to the 1/8-finals and they pulled one of the strongest teams. Real is very poor this season in the Spanish championship, but many experts believe that they will be transformed into the Paris Saint-Germain duel. The “Royal Club” has won the Champions League for the past two seasons, so we can not write them off, and the bookmakers give the French club some chances to move on. The PSG team won the first place in the group stage as the strong team of Bayern Munich was rival. The Parisians, however, proved to be among the best in Europe and battled with the Bavarians at the top of the group. PSG is in a series of six consecutive wins in all tournaments and is a convincing leader in League One, as it is a matter of time to win the title. However, they want to reach at least the Champions League final and have a very strong team, but they will have to make a lot of trouble on Wednesday night if they want to go unbeaten by Bernabeu. Southampton – Liverpool , read our soccer single predictions for that derby. Liverpool is visiting Southampton in a 27th round of the English Premier League. The match will be played this Sunday as hosts will try to record a fifth consecutive match without loss in the league. The Southampton team will be a very difficult task to stop Liverpool’s strong team this weekend. The “Saints”, however, improved their performance in the last few weeks, and after a 3:2 victory over West Bromwich in the last round, they are now in 15th place but only two points above the area before the start of the round. Southampton made a 1:1 draw with Brighton in his last home. Overall, the shape of the team on their own terrain is not very good. Mauriceio Pelegriano’s graduates have four draws and two defeats in their last six meetings at St. Mary’s Stadium. Their last homeless success with 4:1 over Everton on November 26th. Southampton has only three wins in its own field this season, and precisely because of their bad form at home they are not close to the Top 10 ranking. Liverpool’s team missed the win over Tottenham in the last round after Anfield 2:2. Mohammed Salah was very close to bringing the three points to “Merseyside”, Tottenham came to a draw with a late strike of Harry Kane from a penalty. Thus, the two-point difference between the two teams remained, and before this round, Liverpool was in third place in the standings with more than fourth Chelsea. In his last visit to the league, Liverpool won 3:0 on the Huddersfield pitch. Jurgen Klopp’s team is a very successful team outside, but has been hit by three of his previous four visits. This is why Southampton will feel that there is a chance to take something from the upcoming match. Even more encouraging is the fact that Southampton has no defeat in three consecutive home games against Liverpool. The guests recently lost to Swansea with 0:1, so bet enthusiasts may experience a double chance of 1X at this match. So thats soccersinglebets.com prediction for that match. Manchester City – Leicester , soccer predictions . Manchester City Premier League is facing season champion 2015/16 Leicester in a duel in the 27th round of the championship. The match is on Saturday at Etihad Stadium, opposing the first against eighth in the standings. Manchester City is virtually flawless at home, with the exception of Everton’s (1:1) draw in the second round. “Citizens” are in a great series of wins on their own terrain, and Leicester is unlikely to steal anything from his visit to Manchester. In the last round, however, the “skyscrapers” made 1:1 against Burnley as guests. They were close to winning the match and missed a lot of goals for which they were punished by Burnley’s team. Still, the “citizens” are hardly tragic from this draw when their lead over the second-placed Manchester United is 13 points. The host team has 22 wins since the start of the season and broke all the recordings so far in the league. Manchester City beat West Bromwich 3-0 in its last home game and will now strive to record a new convincing victory for Etihad. The guests in this match – Leicester’s team – ranked eighth in the standings with 35 points. Claude Puelle’s teammates have won just one point in their last two league games. In the last round, Leicester was only satisfied with a point in his home-run to Suozzi after a 1-1 draw, and on his last visit lost 1: 2 to Edinburgh’s Goodison Park. One of the team’s best players, Riyad Marse, did not take part in the last two meetings of the team. The Algerian national was very close to a Manchester City transfer at the end of January, but Leicester failed the deal and he refused to train with the “foxes.” Almost certainly Marez will not play on Saturday, which reduces the offensive power of the guests. Manchester City will have little trouble winning the game, as Pep Guardiola’s graduates are likely to take the lead to the break and congratulate them for victory. Atletico Madrid faces Valencia in the most interesting match of the 22nd round of La Liga. The match at “Wanda Metropolitan Stadium” is on Sunday night as against each other we will see the second and third in the standings. Atletico Madrid will try to increase its advance to six points in front of Valencia, winning this home game. The Madrid players will have a big advantage as far as the physical condition of the players is concerned, as the guests had a match against Barcelona on Thursday after losing to Camp Nou with 0:1. This was the fourth consecutive defeat for the “bats” who had a heavy month of January with a busy schedule. This reflected the results of Valencia, who lost their second position and are already pressed by Real Madrid, who are just two points behind them. In the last round, Marcellion’s alumni lost to the white ballet with 1: 4 at home, and now they are expecting a match with the other Grand Madrid. So for only a week, the team faces the three strongest teams in Spain and after losing two of the duels so far, it will seek to leave unconquered by Wanda Metropolitano on Sunday night. Atletico Madrid scored a 3-0 victory over Las Palmas in the last round, putting an end to its three-game series without success in all the tournaments. For the second consecutive weekend, Diego Simeone’s boys will play at home and hope to rejoice their fans again. Leaving the Sevilla Kings Cup was a heavy blow to the hosts who lost both of the 1/2-finals. Atletico has no chance for the title and has also dropped out of the Champions League and the season can not be said to be good for them. They will be looking for their best shape in February to secure the top 4 of the Primera Division. With a possible success over Valencia this weekend, Atletico will have a comfortable lead in second place so they will make the most of themselves in this match and look favorites for victory. Valencia – Real Madrid ,soccersinglebets.com offer you a unique betting tips for that game. Currently, this fight is not a real battle for the third place after Valencia has a five-point lead over the “white ballet”. However, guests have a lesser match so that in the Mestaya victory they will cut the gap to two points. When they play their post, they will be able to overtake Valencia, but they can not progress from the fourth place. Real Madrid has to defend its position after the fifth Villarreal is just a point behind them. In the middle of the week, both teams participated in matches from the King’s Cup tournament. The hosts made it very difficult for Deportivo Alaves. The bats won the first game with 2:1, but on the rematch they lost 1: 2 and so it took penalty shootouts, where they beat 3:2. It was, however, a second consecutive weak match for Valencia. Last weekend, Marcellino’s team lost 1:2 to Las Palmas in the championship. So they missed the opportunity to score points with the second Atletico Madrid, and now they are waiting for a heavy game and may be left behind by Diego Simeone. For Real Madrid, it is hard to tell who is their weakest season this season. Perhaps the latter is approaching that after the “Royal Club” lost 1:2 from Leganes on its own field and dropped out of the 1/4-finals of the King’s Cup. Real did record a victory in the first game with 1:0 and their fans expected at least in Copa del Rey the team to perform strongly, but Leganes’ composition made another heavy blow and eliminated them from the tournament. Real Madrid was without some of his stars like Cristiano Ronaldo, Gareth Bale and Marcello, but that can not justify the weak play of the team, as players like Isko, Kovacic, Benzema, Ramos and Asensio. For Real Madrid, the upcoming visit of Mestaya is a very important game and on Saturday we will see whether they will find a way out of the crisis. Tottenham must be careful with the unpredictable Everton. We offer you our soccer single predictions below. Tottenham continues with the fight for the top 4, but is currently fifth and lags with 3 points from the fourth. In the last round Spurs failed to defeat West Ham and only reached a 1-1 draw even though they controlled the pitch. Previously, they recorded three consecutive wins in the league. Last week they also registered a success in the FA Cup tournament, defeating AFK Wimbledon 3-0. Tottenham lost only Manchester City in its last 9 games, and as a host only relinquished Chelsea as it was in August. Everton is already in the top half of the table and is in the ninth position. After a series of eight consecutive non-loss matches in all the tournaments, Sam Allardyis and the company have three consecutive defeats. They lost in the high league of Bournemouth and Manchester United, and last week they also dropped out of the FA Cup after losing 2-1 to Liverpool Anfield. Overall, he does not practice an offensive style of play, and he definitely relies on defense play, which is likely to be the case in the upcoming match. The duel is more important for Tottenham, targeting the four. Probably the hosts will have the lead in this match, but they must be careful not to get the scenario of the West Ham game. Everton is unlikely to create a lot of stances if they confess their style of recent games. “Caramels” may rely more on contractions and individual bursts. However, Sam Allardieis often hinders even more renowned opponents, and Tottenham may not win the match. On the 1/32 finals of the FA Cup tournament we will witness the Liverpool-Everton Merseyside Derby. We will offer you our soccer bets for this game. Liverpool continued with his good looks in the last game when he pulled a late 2-1 win as a guest over Burnley. This was also a third consecutive success for the league in the league. So the series without losing the “red” is now 16 consecutive fights in all the tournaments. For the last time they have lost Tottenham. In the upcoming FA Cup match, Juergen Klop will probably not be able to count on his best players, Mohammed Salah and Philippe Coettinho, who are injured. Thus, in the top positions, Claude remains with Roberto Firmieu and Sadio Mane. The team is also expected to find the newly-attributed most expensive defender of football history Virgil van Dijk. After the weak start of the season, Everton improved significantly and managed to hold eight consecutive matches without defeat in all the tournaments. The series ended before 2 rounds with a loss of Bournemouth 2:1. On the first day of the new year, “Caramel” allowed a second straight, and it was 0:2 from Manchester United. Here they will try to avoid a third consecutive defeat, and last month they did so, pulling 1:1 at Anfield. In his last 4 games Everton scored just one goal. Last month, Liverpool missed the victory over his rival, although he totally defeated him. Now the hosts are in better shape and we expect this time to be able to take advantage of their goal positions that they will surely create. Everton had gone up, but in the last two games he did not show anything significant. It is not a second time for them to smile at the derby. Leicester welcomes Manchester United in a 19th round of the English Premier League. Leicester’s team suffered two disappointments within three days after two consecutive defeats. On Tuesday, “foxes” lost to Manchester City after shooting and dropped to the ? finals in the League Cup tournament. Claudel Pueuel’s team played less in the course of the game but still scored a goal in the lead time and went to penalty shootout, but luck was not on their side. Last Saturday, the “foxes” were broken by Crystal Palace with 0:3 at King Power Stadium. Now the team will try to stop their series of two consecutive losses at home, but against them the second in the standings Manchester United. The Red Devils, like their upcoming opponent, were also eliminated from the League Cup tournament. Manchester United was eliminated from second division Bristol City, who beat them 2:1 at their Ashton Gate Stadium. Although Jose Mourinho had played Paul Pogba, Marcus Rashford, Zlatan Ibrahimovic and Antony Marsal, the Manchester United game did not work and they disappointed. Surely this shot will not be well accepted by the fans of the team, considering their great lag behind Manchester City in the Premier League. The difference between the two Manchester Grands is 11 points in favor of the “skyscrapers” and the upcoming difficult King’s Stadium’s “Red Devils” visit, City’s advance may increase. Manchester United, however, plays successfully against Leicester in Premier League. The guests are in a series of three consecutive wins against this rival as there is no defeat in the last six games. The Red Devils are not allowed to make mistakes in the league if they want to get closer to the leader and expect the Jose Mourinho team to win this game. Chelsea comes out for a new victory against Southampton . We offer you single soccer predictions for that match. Chelsea is still in third place. They have 4 points ahead of Tottenham, who is behind them and they are lagging behind 3 of the second Man. United. Last week, the champions made an unexpected 1-0 loss from West Ham, but on Tuesday they returned to the winning streak with a 3:1 win at Huddersfield’s visit. They are now a favorite of success in this match of Stamford Bridge. The scorer Alvaro Morata felt back pain and overwhelmed and did not take part in the round. It is now expected to fall on the bench at least on the bench, and so the question marks before Antonio Conte are exhausted. Southampton is positioned in 11th place. The guests achieved only one victory for the last 9 rounds. There are now 4 consecutive games without success. Last week they made 1:1 home with Arsenal, but in the middle of the week they had an unpleasant home loss of 1:4 by Leicester. Since the beginning of the season, “saints” have won only once as a guest, and this happened just over three months ago against Crystal Palace. Chelsea is not as strong as last season, but is still high, so such matches should not be a barrier to the champions. Southampton is not to be underestimated, but has not been in a particularly good shape lately. In our opinion, guests will not be able to reach anything more in this game than honor loss. Several interesting clashes are awaiting us in Germany this week, one of which opposes the teams of Eintracht Frankfurt and Schalke 04, which rank respectively 7th and 2rd in the standings before the round. Both teams have close odds to win, so carefully choose what strategies to use when betting on this match. The statistics in direct matches are in favor of Eintracht, who have won their last six Schalke households, and in the last five have retained a dry network. From the start of the season in the Bundesliga, Eintracht Frankfurt did not show constancy in their game and they played strong with weak matches, having only three victories in their last eight games. Obviously, the household will not be a big advantage to them, judging from their previous results. In the seven games played to date, the team has only two wins. For their part, Schalke 04 deservedly took second place, and in their last ten championship games they did not record a defeat. In the last round a few days ago, the team recorded a win at Augsburg, putting an end to a series of three straight draws. Visiting them could be a hindrance, as in their last two visits they only came to draw but against strong rivals like Borussia Dortmund and Borussia M’Galdbach. Manchester United – Bournemouth, soccer betting predictions. Manchester United hosts Bournemouth in a 17th round of the English Premier League. On Sunday Manchester United lost 1:2 home from Manchester City in the city derby and so their lagging behind the “skyscrapers” is already 11 points. The Red Devils came out against the “citizens,” but Pep Guardiola’s team is unstoppable. United was able to return to the match after David Silva’s victory after Marcus Rhapsford took advantage of Fabian Delft’s mistake to equalize, but Nicholas Othamendi brought City’s success. This defeat ended the Manchester United series four consecutive wins in all the tournaments. Now, however, they accept Bournemouth and will seek to return to the victorious path. Jose Mourinho‘s team was in a series of 11 consecutive home wins since the start of the season before the defeat by the “citizens,” which shows how strong the host is United. “The Red Devils” are favorites for the victory against Bournemouth, which surprisingly does not surprise anyone. The “Blacks” are in 14th place in the standings with a total of 16 points and have three advances in front of the relegation zone. Bournemouth has not won in its last four league games, winning only three points. In the last round, the team made 2:2 as a guest at Crystal Palace and before that they shared points with Southampton at Vitality Stadium. Bournemouth has played a great deal lately since he has scored two wins and two draws in his previous four away games. It is fair to say that these matches were against teams from the bottom half of the standings. Previously, the team lost Tottenham, Arsenal and Everton when it faced stronger rivals as a guest. Manchester United won two of his last three games against this rival with two goals difference. Jose Mourinho’s team should regain a convincing success against the “cherries” to make up for their fans for the defeat by Manchester City on Sunday. Champion Chelsea hits Huddersfield in a match of the 17th round of the English Premier League. Huddersfield recorded victory over the weekend when he beat his teammates Brighton 2-0 with home team thanks to the fantastic performance of striker Steve Muni, who scored two goals for the success of the Gulls. Terriers are now in 11th place in the Premier League’s provisional standings with five points ahead of the relegation zone, and that’s all but a definite lead at the moment. Before the victory over Brighton on Saturday, Huddersfield lost four consecutive Premier League matches, with only the good results of the start of the season keeping them above the line. But this weekend victory should encourage them to show even better game against Chelsea and the fact that they have already won three points at home against Manchester United this season show that they have something to offer when they face strong teams . Chelsea made a 0:1 surprise loss from West Ham on Saturday, losing against a team at the bottom of the rankings and in a terrible form. “The Hammers” had the weakest defense in the league, but in this match they did not allow the blue to score and deservedly took the three points as it was the first success for David Moyce at the head of the team. Before this defeat, Chelsea had another disappointing score of -1:1 at home against Atletico Madrid, thus remaining second in their Champions League group and the 1/8-finals will face Barcelona. Huddersfield may have been in a bad shape lately, but they have won three of their last four games, not doing just against Manchester City, who made a late turn and took the three points. The “terriers” scored in all matches except in two of their households this season, so the two teams’ pocket might mark a good move for that match. Juventus hosts Inter in the big derby of the 16th round in the A Series. The battle for the title in the Italian championship is very fierce this season. This match must give some answers as to Inter and Juventus chances to win the Scudetto in 2018. Intermediate Leader Inter has an asset of 39 points, while Juventus hosts 37 points in third place, with Napoli 38 points between the two teams. For the Juventus team this will be the second consecutive derby in Serie A, after the last round they beat Napoli with 1:0 at San Paolo. Gonzalo Iguayin punished his former team and so deposed Neapolitans from the top to bring Juventus back to the title. Before this success Juve beat Croton 3-0 at home and in the middle of this week beat Olympiakos 2-0. Thus, the “bikonkers” will seek a fourth consecutive win in all tournaments, but Inter has not lost since the start of the 2017/18 season. After several experiments on the coaching post in the past two or three years, Inter finally found his man in the face of Luciano Spaleti. The experienced specialist was doing wonders with the Roma team and now he is one of the best coaches in Europe at the wheel of the “Nerazzurri”. Inter won four of his last five A Series games, defeating Kievo with 5:0 in the last round to climb first in Calcio for the first time in a long time. On his last visit, Inter beat Cagliari 3:1, and before their visit to Juventus Stadium, they had three wins in their last five away games. Last season, Juventus won 1-0 home against this rival, but now we expect Inter to score a goal. Mauro Icardi and Ivan Perisic are in incredible shape and are very likely to score goals while “Old lady” almost misses to score on their own pitch. Liverpool hosts Spartak Moscow in a match from the last round of the group stage of the Champions League. Liverpool is ranked first in this E-band with a nine-point asset. Merseyside have one more than the second Sevilla and three advances ahead of the third Spartak Moscow. The final round will be very interesting as unexpected turnips can be won, but Liverpool is unlikely to lose his place among the top two teams in the final standings. It is fair to say that Liverpool failed to make the best start in the group stage of the Champions League, as they failed to defeat Sevilla at home, but despite the few draws, they were at the top of the group before the final round. We expect to see Juergen Klop’s alumni in full sparkle against Spartak Moscow because Sevilla plays against Maribor and the German specialist knows perfectly well that his team will probably need a victory to stay in the first place. This, however, could have been avoided in the last round. Merseyside had a 3-0 win over Sevilla to Ramon Sanchez Pichuan at half time but eventually failed to win after a 3:3 draw, which again showed the team’s defenses in defense. Liverpool, however, showed an improvement, defeating Stoke 3-0 and defeating Brighton 5-1 in the Premier League, and in both matches the “Reds” played away from home. In the upcoming match Spartak Moscow can not just go out and defend himself. If they want to have a chance to qualify for the 1/8-finals, they have to go out and look for goals against Liverpool, and given that they have failed to keep a dry network in the Champions League this season, their protection will have a lot of problems at Anfield and we expect to have a clash. Read our single soccer bet predictions below. Manchester City did not have the best week as a game, but they made important victories over Huddersfield and Southampton. The Heavenly Stars won both matches with a 2:1 score as Rahim Stirling was the big hero. The English national scored a bit of a lucky goal against Hudsfield last week in the closing minutes for John Smith’s complete turn and during the week he realized a great goal in 96th minute against Southampton to bring the success of his team and 12th consecutive team victory in the Premier League. A possible Sunday victory will equal the record for all time for one-time victories in a season currently held by Arsenal. With luck and talent on their part, it is hard to believe that they will not defeat West Ham and their chances of improving the final record may fail at Old Trafford next weekend. West Ham team continues with weak results and David Moyes has so far failed to change anything on the pitch and in the dressing room. The effect of his appointment was expected to be positive, but on Wednesday the “hammers” lost 0-4 as guests of West Ham. Currently Londoners are in 18th place in the standings with two points to the rescue zone. They will face Manchester City, Chelsea and Arsenal in the next few weeks, and it will not be possible for the team to get away from the bottom to Christmas. The visitors are without a win in five consecutive matches and have received 30 goals in their matches so far, making them the weakest defense team in the Premier League. On their own ground Manchester City won six of their seven matches so far and scored 26 goals, so we expect to make a match against Londoners. Hoffenheim will at least look at something from Leipzig. Soccer single predictions for the match below. Hoffenheim is positioned in seventh position. The team had a hard last week in which they lost to Europa League after losing 3:1 as a guest from Braga. On Sunday they also lost in the Bundesliga, but this time as a guest of Hamburg with 3:0. So this was the third loss for Hoffe this season in the championship. Over the past season the hosts have lasted for a long time without loss, while this season they have three and are not able to keep very high. At home they traditionally performed well, but in one of their last households they lost 1:3 from Borussia Monchengladbach. Leipzig is again in second place. He lags 3 points from the top and has two heads in front of the third Schalke. The guests did not start very convincingly this season, but later they were speeding up again. They are even on the brink to qualify for their debut in the Champions League after winning 4:1 last week in Monaco. In the last round, they were expected to win their home game against Verder by 2-0. Leipzig also had three losses, the last of which was from Bayern Munchen. With 8 wins in 13 rounds, however, they hold the second position for the moment. There is a certain drop in Hoffenheim’s shape, which may have an impact in this match. Leipzig’s RB looks better than his opponent and has recently come into shape. As a rule, Hoffe plays strong at home and earlier this season beat Bayern. At this point, however, the situation seems to be different and we will bet on the win for the guests. We also expect to have goals in the match. Napoli has a chance to make a serious request for the title.Read our single soccer predictions below. On Friday begins this round of Serie A. Even on this day is the derby between Napoli and Juventus. Napoli makes a strong impression this season and has a great opportunity to finally attack the dream title. They currently have two points ahead of the top of the second Inter. Still Neapolitanians are defeated with a balance of 12 wins and two draws. San Paolo failed to defeat only Inter and the game ended without goals. Perhaps not very expected, but Napoli has only scored 9 goals in Serie A so far and together with Roma are leading the other teams on this bench. Even the hosts of the soccer picks soccer tips soccer tips soccer tips soccer tips soccer tips apparently felt that defense is the most important, and Marek Hamshik said that the champion will become the team with the best defense. On Sunday, Napoli did not give much pride in visiting Udinese but achieved their goal and won the win with 1:0. Currently, Juventus is third and lags 4 points from the leader. Champions have already registered two losses this season, which were from the teams of Lazio and Sampdoria. The defeat from Sampdoria came at the last visit of Juve, when they fell by 3:2. In the last round, they did not have much trouble with Croton and won their home game with 3:0. “The old lady” has raced 40 hits so far in the league, which is the most of all teams. A possible loss will now reduce the chances of another bianconer title. The match for the guests may miss Gonzalo Iguaine, who has undergone an arm surgery that is expected to pull him out of the box for the clash. However, he trained with his teammates yesterday and could be at least on the bench. A match that may not resolve the title, but will certainly influence. Naples have boosted this season and are performing better than the previous one. We can not say about Juventus, which is a weaker idea in its performance so far. In such games everything is possible, but this time Napoli is expecting to win and remain at the top. Both teams know they are capable of marking, so hits in both doors are also expected. Everton will try to live with a possible victory over West Ham. Read our single soccer prediction below. Expectations to Everton continue to be unjustified. Despite the good selection in the summer, the hosts can not do anything memorable until now. Now they are in the 16th position and at one point they have even fallen into the area of ? ?the fallen. The change of Ronald Kumman has not had a positive effect yet. Adjunct mentor David Nansworth recorded only one win of 7 matches with 3:2 over Watford. In the last week, only a few days the “caramels” registered two heavy losses. In League Europe they lost and lost 1:5 from Atalanta. On Sunday they also fell 4:1 as a guest from Southampton. In their last 9 games they score at least 2 goals in their goal. All three victories that Everton has achieved this season have been attained at their Goodison Park. West Ham also performs well below expectations and is currently in the relegation zone, taking the 18th place. The guests have only two wins so far. The last of them was 1:0 over Swansea and since then six rounds have been unsuccessful. After losing by 1:4 former coach Slaven Bilic split with his post. In his place came former Everton coach David Moyes, who is in search of his first victory. Ever since he picked up the “hammers” he lost 2-0 away from Watford and Friday 1:1 home with Leicester. Watford may be a stumbling block for Manchester United. Read our soccer single bets prediction here. Watford is in the top half of the table and is in eighth place. In the last two rounds they recorded two wins without a goal. They won their 3:0 visit to Newcastle in the last round and before that they won 2-0 with West Ham. But before these two successes were in a series of 3 losses. So the hosts are very stable in general. This can also be seen from their matches against the leading teams. Here they made 3:3 and turned Arsenal to win by 2:1. but prematurely managed a 0:6 defeat from Manchester City. The cashout option can also serve us here, and you can find more information about it. Manchester United is in second place, but lags 8 points from City rival City. On Saturday, Brighton defeated Brighton with only 1: 0 at Old Trafford, while in the week he lost 1: 0 from Basel in the Champions League. This was the third loss in the last 4 visits of the “red devils” in all the tournaments. In the high league they have not won as a guest for more than 2 months when they beat 1-0 Southampton. Recently, there has been a slight decline in United’s form. However, guests stay with the most stable defense in England, allowing only 6 goals. Phil Jones and Michael Carrick are out of the box, and we’re already seeing Zlatan Ibrahimovic coming in. Watford’s unpredictable team hopes to get something out of this match and continue with a good performance from the last two matches. Manchester United seems to have lost its brilliance at the start of the season. Here, too, we expect to have trouble with this visit and no wonder they will not win it. As an appetizing bet, the Manchester United option seems to score below 1.5 goals here, and our other choice will be a double chance for Watford. Espanyol – Getafe , single soccer predictions . Espanyol hosts Getafe in a match from the 13th round of “Primera Division”. The hosts in this match, the team of Espanyol, have been disappointed since the start of the season. After 12 rounds, the team is in 16th place in the standings with 13 points and is only six points above the danger zone. In their last five games, the “Catalonians” have one victory that came on their field – 1:0 against Real Betis. In the last round Espanyol lost 0:2 from Valencia home, and before that he retired as a guest of Alayes. In the last five games, the team scored only two goals – one against Bettis and one for Real Sociedad (1:1). In his six households since the start of the season, Espanyol has three wins, one draw and two losses. Their strongest “Catalonians” played against Deportivo La Coruna when they won 4-1. That was at the end of September, and it seems unlikely that the team will now score four goals in the game. Getafe’s team has three points more than their upcoming opponent and ranks 12th in the La Liga table. Getafe can enter the Top 10 if he leaves with three points in Barcelona. The Madrid club is in a better shape, as in its last four games in Primera registers two wins and two draws. Their last loss was in the derby with Real Madrid with 1, 2 on 14 October. They then won against Real Sociedad and Alayes as both hosts and made a draw at the beats of Bethes and Levante. Last season, Getafe won 3:1 at home against Espanyol, but lost his Cornelia-El Prat visit with 0:1. But now we expect the Madrid team to be able to score at this stadium, as it has made many hits lately, but is unstable in defense and Espanyol also has to hit the goal.